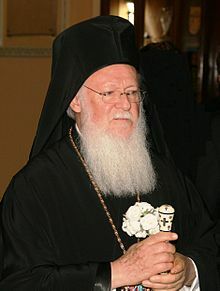 The Ecumenical Patriarch of Constantinople Bartholomew I has called for “a fresh deliberation on the fate of the earth” while delivering a keynote speech during the Arctic Circle Assembly in Reykjavik, Iceland.The assembly drew more than 2,000 participants from 50 countries, joined religious leaders with scientists, government officials, advocates, and indigenous people on Oct. 13-15. A conference organized by the World Council of Churches and hosted by the Evangelical Lutheran Church of Iceland under the theme “Just Peace with Earth” was held in conjunction with the Arctic Assembly. The climate change agenda that he has been pushing is basically the same one that is in Pope Francis’ encyclical Laudato Si as well as the same one adopted by the United Nations a couple of years ago called the New Universal Agenda, also called (by me) the New Catholic Agenda (as catholic means universal). The Vatican’s Pope Francis was the keynote speaker at the UN the day that the New Universal Agenda was adopted. This, then, got adopted as the Paris Accords. While this was pushed by then US President Barack Obama, current US President Donald Trump has opposed it and stated that the USA could not support it as written (see Donald Trump announces withdraw from Paris accords: A slap in the face to Pope Francis and the Europeans?). It should be clear that the Eastern Orthodox and the Church of England have been working together for some time to see how they could find areas of agreement to promote. The ecumenical and inter-faith movements are moving ahead, yet they WILL NOT RESULT IN A CLEAN CLIMATE NOT REAL AND LASTING PEACE. Yet, many Protestants are falling for it (see Beware: Protestants Going Towards Ecumenical Destruction! and Pope Francis speaks of ecumenism to 52,000 Pentecostals and others). The Bible also shows that irrespective of whatever international agreements there may be, they will NOT save the environment–the Bible shows that it will take the return of Jesus and the establishment of the millennial Kingdom of God to do that (Matthew 24:21-22; Revelation 11:18; see also The Bible, Christians, and the Environment). The Bible also clearly shows that the ecumenical/inter-faith movement will also end in destruction (Revelation 18 & 19). This is not something that Catholics or the Eastern Orthodox or the Protestants should want (see also Why Should American Catholics Fear Unity with the Orthodox? and Beware: Protestants Going Towards Ecumenical Destruction! )–yet many of their leaders are promoting this! Catholics, Orthodox, Protestants, and others need to be concerned about the type of unity that is actually being promoted and what the climate change agenda really is about. This entry was posted on Thursday, October 19th, 2017 at 7:00 am	and is filed under Religious News.